Sell Testo 810, Temp / Humdity / Velocity / Refrigeration, Flue Gas, Water Analysis, Light and RPM with cheap and quality prices, contact our sales at: +6281283804273, wa: +6281932632003 only at Darmatek online store in south Jakarta. Testo is the world’ s leading manufacturer in the production of test and measurement instrumentation. With years of experience, Testo develops solutions for a wide range of applications that require measurement. The endless number of solutions provided has gained more and more customers each and every year, who all benefit from the Testo range. Testo’ s instruments are developed in co-operation with professionals working in the field, resulting in reliable and user friendly instruments. With an experienced team, Testo run an independently accredited ISO 9001: 2000 and ISO 17025 laboratory, committed to meeting our customers’ repair, servicing and calibration needs. 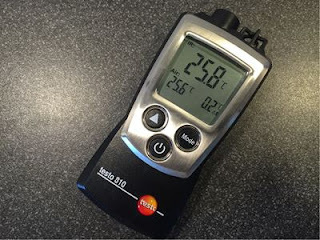 With UKAS accreditation to ISO 17025, Testo offer an independent calibration service for most makes and models of humidity, dew point and temperature measuring instruments. Testo 810; 2-channel temperature measuring instrument with infrared thermometer with laser spot marking and integrated NTC air thermometer, incl. protective cap, batteries and calibration protocol. Testo 810 facilitates air temperature and simultaneously non-contact surface temperature measurement using one instrument. For instance, the surface temperature of a radiator can be easily compared to the air temperature in the room.